What happens to a land that is a creature? Cool deck! 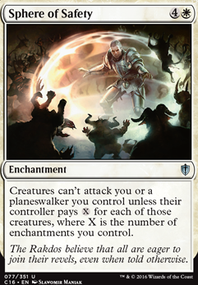 The one thing that jumps out to me is I think 10 shock lands is waaaaaaay too many. I would go down to 2x Overgrown Tomb , 1-2x Godless Shrine , and 1x Temple Garden , and add 1-2x Swamp , 2x Shambling Vent or Stirring Wildwood , and some number of Blooming Marsh / Concealed Courtyard . While shock lands are quite good, playing too many can be a downside against decks like burn and affinity. Other than that, this looks sweet! +1! Against control Carnage Tyrant is legit. It's not a silver bullet because they run both Settle the Wreckage and Terminus to answer it. And for that same reason you're not going to find an unstoppable answer. Id say 1-2 Tyrant in the main, 2-3 Treetop Village/Stirring Wildwood also in the main with 1-2 Choke and 1-2 Sorcerous Spyglass/Pithing Needle in the side. Will improve your Control match up. 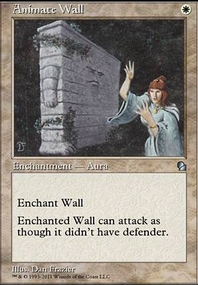 Your mana base probably can't afford them but a couple Field of Ruin/Ghost Quarter will also help against both Control & Tron. As it is your sideboard is really weak. I would revise the whole thing. Especially since you're in white. There is no reason at all you shouldn't be running stuff like Stony Silence. Against Tron. 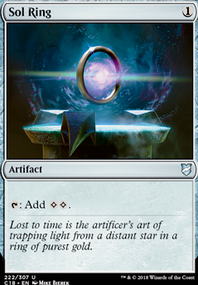 Basically land hate and exile effects with a quick clock. So a full Path to Exile play set in the main. Soul Tithe, Oblivion Ring, Mwonvuli Acid-Moss, Stony Silence, Damping Sphere, Aven Mindcensor, Gaddock Teeg (which u have). If you want something that works with your deck I would use Wurmcoil Engine. It dodges Ugin & All Is Dust and if they crack an O-Stone will leave bodies behind. If you are planing on preordering be wary that the set has not even released yet and they already leaked some of their garbage rares: Lavaclaw Reaches, Stirring Wildwood, and Tasigur, the Golden Fang. Even Raging Ravine and Creeping Tar Pit seems like a feels bad Box Topper. Guess which Box Toppers will be printed at a higher rate. I don't trust this set at all, especially with an MSRP $50 CHEAPER than a PS4 and Nintendo Switch. DesArthes: Thank you! Sigil of the Empty Throne was in the original version of the deck, but I've found that it usually doesn't hit the field until my hand's almost empty, so it wasn't of much help by then. 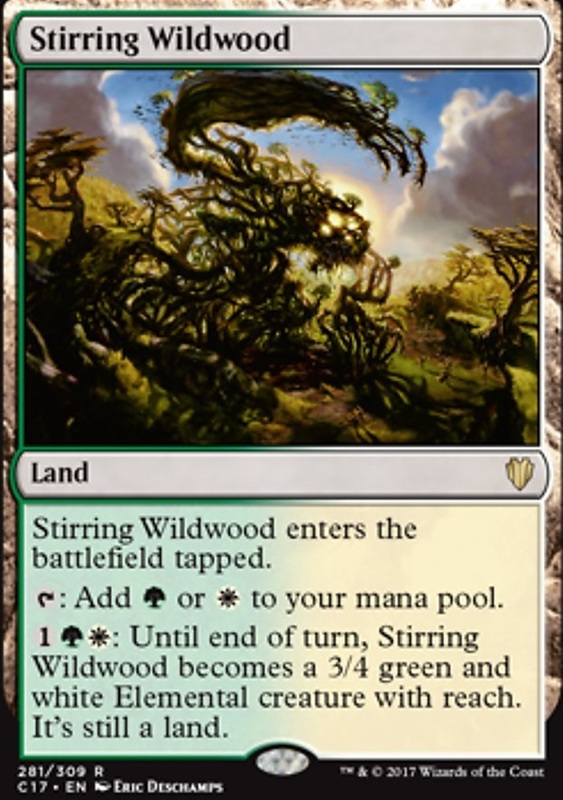 I've found that Stirring Wildwood actually pulls its weight as a wincon, surprisingly enough. 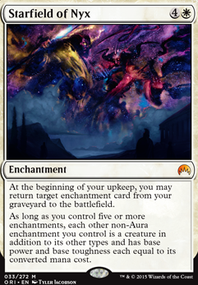 I didn't know about Kruphix's Insight, seems like it'd be an excellent fit here, but the Eidolons do have the benefit of being recurable with Starfield of Nyx... I'll think about them, probably do a test run to see how they fit instead of the creatures! 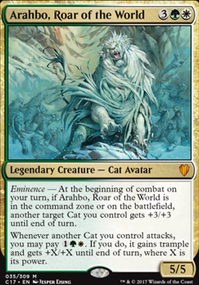 Leonin Arbiter is good enough for fetchlands. 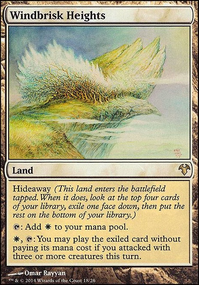 suppression field is very meta dependent..
if you want to keep them out of mana.. might as well put 1-2 Ramunap Excavator then grab Ghost Quarter multiple times.. similar to my deck GW Land Tax. but just keep it on the light side.